Whether you’re buying from them, doing business with them, hiring them or thinking of working for them, it always pays to check a business’s reputation. You want to make sure that the company you’re going to work with has safety measures in place to guarantee the safety of your machinery and its workers. Selecting the right company to work on your machinery is a process you have to be smart about. The company with the lowest price isn’t always the right one. In some cases a company will quote a project with a price that is too low accidentally. This happens from time to time in large industrial companies. A company is trying to merge into the industry but does not have enough knowledge to properly bid the job. As you request and RFP you have to protect yourself by looking out for tell-tale signs that this is happening. When choosing the right industrial maintenance & remanufacturing company, you should rely on a service provider who can provide single source design, fabrication, and installation all in one place. This is something that not all industrial companies can do. This factor makes a huge difference when it comes to quality of work you will receive as well as savings that your service provider will pass on to you. When selecting an industrial maintenance company, you want a partner you can rely on with all the services and features your company needs. Research is your secret weapon. Look up any reviews. How long have they been in business? What is thier experience? Do they have references/portfolio? What are thier strengths? Do they perform thier work in house or do they send it out? Do they have emergency services? Do they understand your business model? Do they provide a warranty on thier services? Use online tools such as, Glassdoor, Hoovers, Better Business Bureau etc. to learn about thier reputation. Look at thier social media platforms, many times you will see reviews and interaction on Facebook, LinkedIn and more. Lightning Bay Pneu-Draulics has the experience and capabilites to repair and remanufacture most all makes and models of cylinders, no matter the size or application. With our multiple hones, lathes, boring mills, straightening presses and torque benches, we can handle most any size of cylinder. We also repair accumulators, intensifiers and swivels (rotary manifolds). We have expert service technicians that have a passion for getting the job done right. With highly skilled laborers, top-of-the-line equipment and creative minds, we are capable of just about anything. Any service we provide to our customers that have any mechanical issues within one year of service, we will repair or replace our workmanship at no charge. Customer Service is Our Priority! 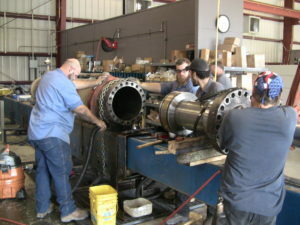 Our technicians can go to your site to troubleshoot your machinery at times convenient to your production. Using our custom-designed cylinder maintenance table, we can completely remanufacture cylinders of any size maintaining OEM specifications. If the machine can be transported for remanufacturing we can haul it for you or you can freight it to our facility. Static and dynamic testing up to 10,000 psi with a 200 gallon test bench for even the largest of bores and strokes. Since 2004, Lightning Bay Pneu-Draulics has exceeded expectations and delivered superior hydraulic and pneumatic field services to customers across the state and globe. We are well known for upholding the industry’s highest standards and matchless capabilities. With highly equipped service trucks, a full service machine and fabrication shop, and top quality talent, Lightning Bay Pneu-Draulics continues to provide 24/7 professional service. As the elite provider in the southeast, we will continue to decrease the bottom line for our customers with integrity, proven experience, and service excellence.